In a free, public lecture David Salle, a painter, writer, set designer and film maker, looks at "failed" paintings and asks, "How does one form an artistic identity?" 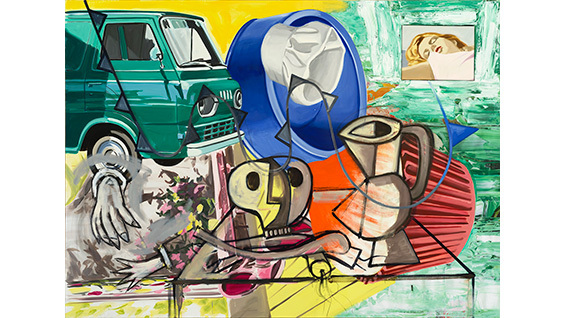 David Salle appears as part of the Spring 2016 Intradisciplinary Seminar, part of the Robert Lehman Visiting Artist Program at The Cooper Union. We are grateful for major funding support from the Robert Lehman Foundation, Inc.
David Salle helped define the post-modern sensibility by combining figuration with an extremely varied pictorial language. Solo exhibitions of his work have been held at museums and galleries worldwide, including the Whitney Museum; Museum of Contemporary Art, Los Angeles; Stedelijk Museum, Amsterdam; MoMA Vienna; Menil Collection, Houston; Haus der Kunst, Munich; Tel Aviv Museum of Art; Castello di Rivoli; and the Guggenheim, Bilbao. Although known primarily as a painter, Salle's work grows out of a long-standing involvement with performance. Over the last 25 years he has worked extensively with choreographer Karole Armitage, creating sets and costumes for many of her ballets and operas. Their collaborations have been staged at venues throughout Europe and America, including The Metropolitan Opera House; The Paris Opera; The Opera Comique; Lyon Opera; Brooklyn Academy of Music and the Opera Deutsche, Berlin. In 1995, Salle directed the feature film Search and Destroy, starring Griffin Dunne and Christopher Walken. Salle is also a prolific writer on art. His essays and interviews have appeared in Artforum, Art in America, Modern Painters, The Paris Review, and Arts Magazine, as well as numerous exhibition catalogs and anthologies. He is a regular contributor for Town & Country Magazine. How to See, a volume of Salle's collected essays, will be published by W.W. Norton in Fall, 2016.